This post will arrive in your mailbox a little bit later than usual. I like to write at night before I go to bed but we were home late last night from the best meal we have had in France. Recommended by our hotelier, L’Oceanic in Chinon gets five stars in our books. I would love to tempt and entice you with lovely photos of our meal, but apparently, being a food photographer is harder than one might think. My meal started with a beautifully flavored crab bisque. I can tell you that the photos I took of it and the main course didn’t do them justice. Almost exclusively a fish and seafood restaurant, Dennis and I both enjoyed lovely fish dinners. It’s a little bit complicated ordering from French menus. When you’re ordering chicken, you know you’re getting chicken but you’re not entirely sure how it will be prepared. Tonight was no exception. We knew we were getting turbot and river carp but it’s exact presentation was a surprise. Both were delicious and beautiful. The French desserts are always as beautiful as they are delicious. Somehow it is easier to photograph desserts. They seem to come across a little bit better. Here’s tonight’s selection of apple tart and chocolate mousse. Yesterday was another 60 kilometers of riding. We started the morning riding along the Cher River which flows into Loire River about 10 kilometres out Tours. It was a busy day of château viewing. We passed by the Château Villandry, with its impressive gardens, the Château de Langeais and the Château d’Ussé. The Château d’Ussé is referred to as the Château de la belle au bois dormant. It is said to be the inspiration for the book Sleeping Beauty by Charles Perrault. We were there in the afternoon and the sun had already moved behind the château so it was impossible to take a picture. We are somewhat suffering from ABC syndrome! Another bloody château! Instead of touring each of the châteaux we passed, we happily viewed then from the velo path and cycled on. Our home for the night is Chinon on the Vienne River where we met up again with our friend, Jeanne d’Arc. Jeanne d’Arc came to the Château de Chinon in 1429 to petition Charles VII, the Dauphin of France. Charles granted her petition and she joined the siege of Orléans. She is commemorated in the main square in Chinon, as she is in Orléans. 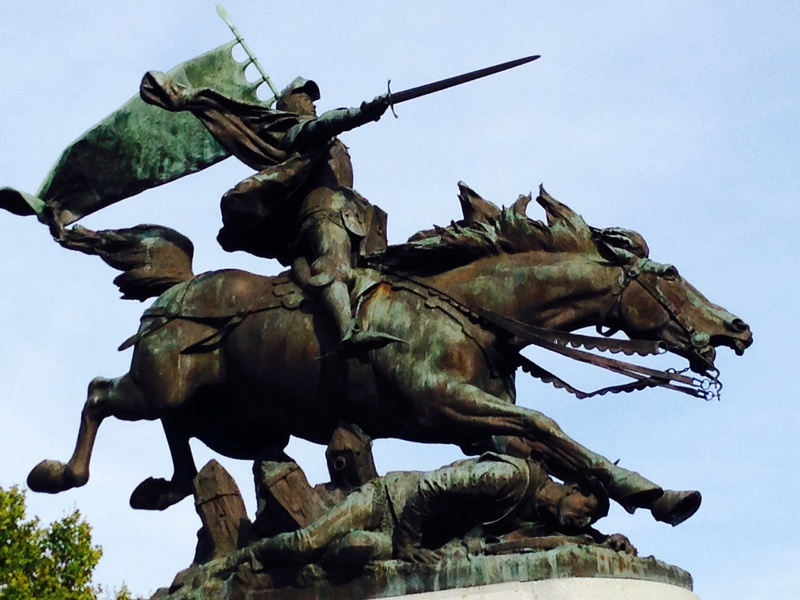 (Check out my early post on Orléans for more details on Jeanne d’Arc). Our hotel for the night, the Hotel Diderot, is a 15th century mansion converted into a hotel. Loveliest of our hotels to date. P.P.S. I tried to post this last night but the Internet wouldn’t cooperate so this actually happened two days ago. Categories: Cycling the Loire River | Tags: Chinon, Joan of Arc, Langeais, Ussé, Villandry | Permalink. Only a week in and I am soooooo jealous !!!!!! Everything looks and sounds amazing !!!! Everything is good here, as well !!! I’m glad to hear life in Winnipeg is good! Thanks for following the blog and showing to my mom. It sounds like you are having a fantastic time! I am loving reading your blog and seeing your beautiful pictures. It almost makes me feel like I am along for the ride. I hope your adventure continues to fantastic, day in and day out! Hi Alison, I’m glad you are enjoying it. It’s very fun to do. Wow! Sounds amazing and enjoying the pics especially the foodies……….LOL. Have another great day tomorrow! The food here is so fabulous. And it’s true. They really don’t have the North American obesity problem.